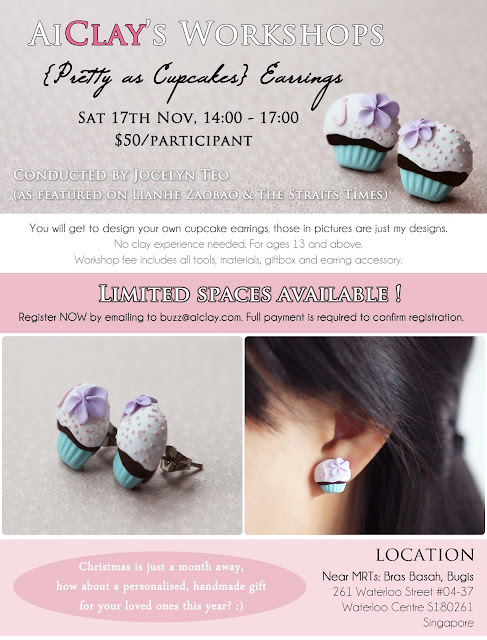 AiClay - a Haven of Miniature Food: Pretty as Cupcakes Earrings - design your own! Excitinggggggg news! I have finally organised a workshop where we would make adorable cuppycakes, and you'll get to design your own! Workshop details are in the poster below. Head here to see a bigger-sized poster. Ohh how adorable are these! Wish I could attend one of your crafting workshops, always looks adorable! This miniature stuff makes me remember my childhood. I want something like this to play with when I was little. Its so gorgeous and adorable. A great accessory too.